The arrival of paddy has been increasing by the day in grain markets with government procurement having already started. Farmers with PR-13 and PR-21 varieties are not even getting the minimum support price (MSP) while PR-14 and Pusa-1509 varieties are getting a good response. 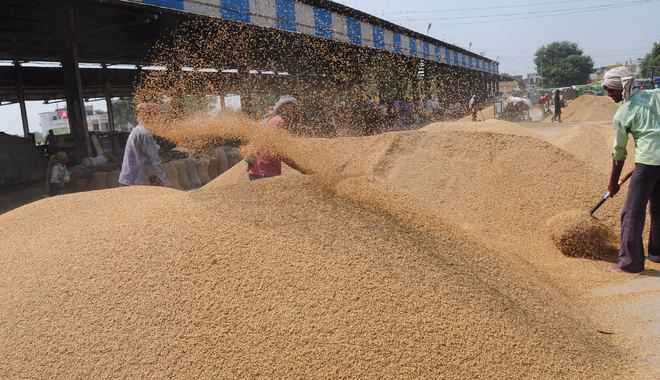 Around 3.7 lakh quintal of paddy arrived at the Karnal grain market till yesterday, of which 56,000 quintal had been procured by government agencies. The arrival was 2.23 lakh quintal during the corresponding period last year, of which 1.33 lakh quintal had been procured. This year, the PR-13 variety was being procured at Rs 1,520 per quintal while the MSP was Rs 1,550. The PR-21 variety was being procured at Rs 1,550 per quintal compared to MSP of Rs 1,590. “I brought the PR-21 variety from two acres, which fetched me Rs 1,550 per quintal. I have not been told the reason for a rate below the MSP,” said Rajinder Kumar, a farmer. Puran Singh’s PR-21 variety was procured at Rs 1,570 a quintal due to high moisture content. He said the government should develop a mechanism for transparency. Rajbir, who brought the PR-13 variety from four acres, said his produce was procured at Rs 1,520 while the MSP was Rs 1,550. He claimed that farmers were being cheated on the pretext of moisture. This should be stopped and farmers should be given the price of their produce. On the other hand, the PR-14 variety had been getting a good response. It was being sold at Rs 1,650 per quintal with Rs 1,590 as its MSP. “My PR-14 variety was procured at Rs 1,650. Last year, I had received Rs 1,450 for this variety,” said Joginder Kumar, a farmer. Pusa-1509 was also fetching good returns for farmers than the past two years. It was being sold at between Rs 2,600 and Rs 2,700 per quintal. It was sold at between Rs 1,700 and Rs 1,800 last year. Sumit Kumar, a farmer, said his Pusa-1509 variety was procured at Rs 2,650 while it was sold at around Rs 1,700 last year. When contacted, market committee secretary Asha Rani she she was not aware about this. “If you give me names of farmers and commission agents, I will get it checked,” she stated.